The future of quantum photonics will see an increase in complexity of photonic devices and the quantum states they produce. As the technology becomes more mainstream, techniques for large-scale photonics manufacturing will need to be developed. A large hurdle in making this transition lies in testing and verifying the operation of these devices. The technique used to perform this task, photon coincidence counting, is an experimentally cumbersome task. It requires expensive, specialised apparatus to perform and can take a long time to complete. The technique we have developed, on the other hand, requires only tuneable lasers and standard photodiodes, and can be completed in a fraction of a second. 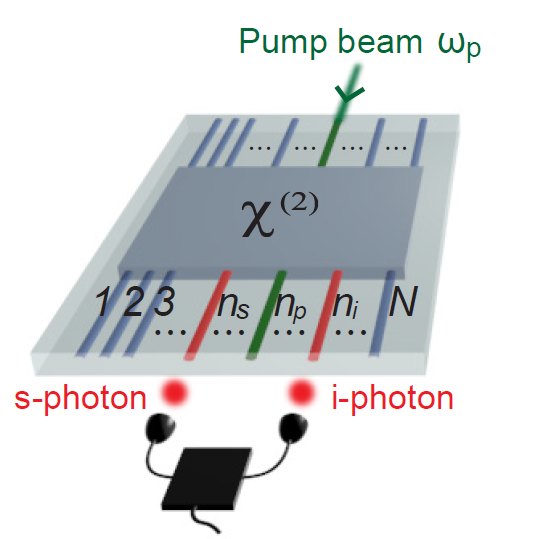 Photon coincidence counting in a general photonic device. A time-consuming process. Our technique applies to any nonlinear photonic device that produces photon pairs by Spontaneous Parametric Down-Conversion (SPDC). By making a rigorous connection between SPDC and the classical nonlinear process of Sum Frequency Generation (SFG), we showed that SFG measurements performed in the reverse direction of the device predict the behaviour of SPDC performed in the forward direction . 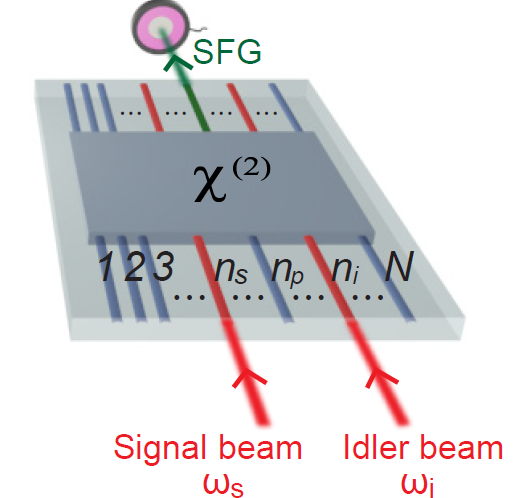 Our experiment was performed on a lithium niobate waveguide device we fabricated , with an asymmetric periodic poling for engineering a particular two-photon output state . This three waveguide device was designed to generate spatially separated photon pairs filtered from the pump laser, with the pump, signal and idler photons all emerging from separate waveguides. We then performed our technique, as well as standard coincidence counting, and found that the two methods agreed with a fidelity of . Comparing this technique theoretically to coincidence counting using state-of-the-art single photon detectors, we can complete our measurements four orders of magnitude faster, with two orders of magnitude better accuracy. Also, the cost associated with single photon detectors far exceeds that of commercially available tunable lasers, making our technique cost-effective for large scale characterisation of quantum nonlinear photonics. F. Lenzini, et al., Direct characterization of a nonlinear photonic circuit’s wave function with laser light, Light: Science & Applications 7, 17143 (2018). F. Lenzini, S. Kasture, B. Haylock, and M. Lobino, Anisotropic model for the fabrication of annealed and reverse proton exchanged waveguides in congruent lithium niobate, Optics Express 23, 1748 (2015). J. G. Titchener, A. S. Solntsev, and A. A. Sukhorukov, Generation of photons with all-optically-reconfigurable entanglement in integrated nonlinear waveguides, Physical Review A 92, 033819 (2015). Our protocol in the above device. Standard lasers and photodiodes make it fast and accurate.